The new building energy-saving house (built in 2016) offers a living space of 85m², 3 bedrooms, a living room with sofa bed, a kitchen, a whirlpool bath and a sauna for 4 people. Bed linen and towels can be booked for a fee. On the property is another holiday home. The fenced property offers communal garden use with barbecue area. Leash duty on the property and in the garden. On the property there is another cottage with guests and possibly other pets. A children's travel cot and a high chair can be rented for a fee. Deposit of € 100,00 has to be paid 4 days before arrival to the account and will be refunded after departure minus the additional costs. 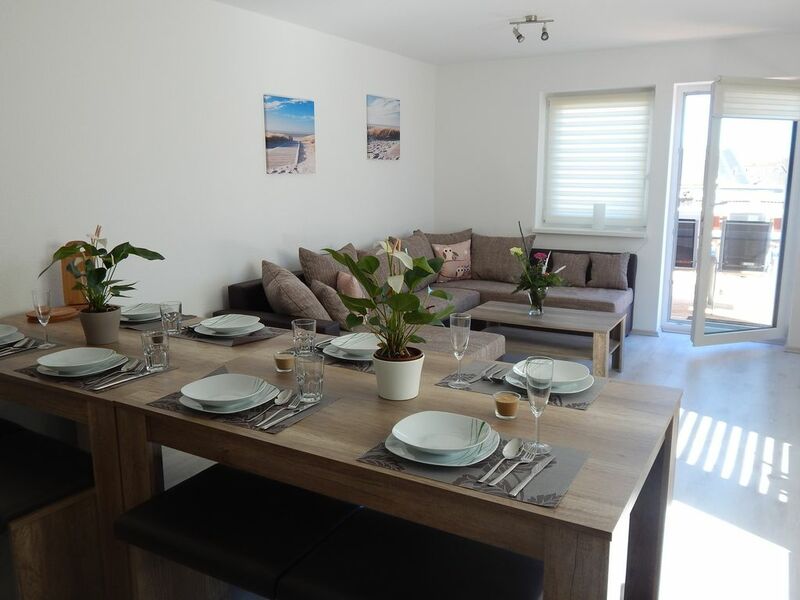 Additional costs: Electricity / kWh = 0,30 € Water / m³ = 5,00 € Heating / kWh = 0,10 € Bicycles (28er, 24er, 20er frame height) can be rented upon availability and for a fee. Ostseeurlaub with own horse possibleThe horses can be provided in 5.6 km distance to the paddock with Offenstall (5.00 m x 6.00 m) from October to March for self-catering. From the stable to the beach is 6.1 km. Price per horse / day € 21,50. Handball hay € 3,50. Everything else on request. Beach riding "Finally riding on the beach" is a common request of many riders - with us it becomes reality. From October to March horses are welcome on the beaches of the Bay of Lübeck, in Neustadt even until the end of April. Scharbeutz is located in the south of the Bay of Lübeck, framed by the hilly nature reserve of Holstein Switzerland, protected in a central bay location. The house is located in a quiet cul de sac. The train station is about 500m away. The hiking trails can be reached in about 4 minutes. Shops can be reached in about 10 minutes.